A black and white negative of one of Julian Beecroft's children. 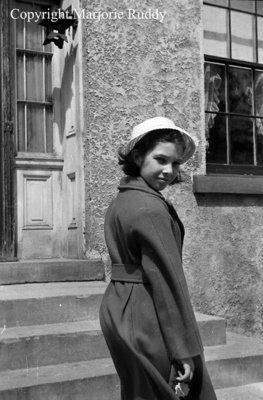 She is standing in front of the steps of the Beecroft residence known as the Grange. In this view she has her back to the photographer and is looking back over her shoulder. She is wearing a long jacket and hat. We believe the photograph to be of Norma Beecroft. Julian Balfour Beecroft was born at Toronto on 19 March 1908. He came to Whitby in 1918 as a student. Beecroft was an accomplished pianist who was invited to play with George Gershwin in New York when he lost three fingers in a woodworking accident. He was an inventor for the remainder of his life, building boats, photography equipment, furniture, and metal forging machinery. He invited the first wire and tape voice recorders but failed the patent them. In 1947, he set up a machine shop at his home on Mary St. E. There, he patented a hydraulic control system for the Avro Arrow Interceptor and many other inventions. In 1978, he moved to Port Hope and again to Sharbot Lake in 1984. Beecroft died at Perth on 20 January 2008 and is buried at Union Cemetery, Port Hope. Beecroft Child, c.1947, Marjorie Ruddy. Whitby Archives A2013_040_837C.